Two thoughts about stock market value from our Purposeful investing Course (Pi) suggest that there is extra profit potential in markets ahead. Most big profits (and big losses) in stock markets come in spurts. 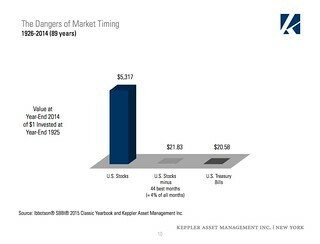 The chart below from a Keppler Asset Management Asset Allocation study shows that the problem with market timing is those very small, very specific periods of time in stock markets have very large influence on nominal returns. The chart below shows that all of the extra profit potential of US stocks over US Treasury Bills in the last 89 years was contained in just 44 months, 4% of the entire time. The first value thought is a question. Are we smart enough to capture that 4% exactly? The second thought comes from Keppler Asset Management’s October 2015 Good Value Developed Market Report. Keppler revealed an important global equity market event that has only taken place three times in 45 years. Keppler reported that all twenty-three markets included in the MSCI World Index declined last quarter. Moreover, both in August and in September all twenty-three markets declined. Such a sellout in two consecutive months happened only three times in the 45-year MSCI history: in August/September 1990 (Saddam Hussein invaded Kuwait), in June/July 2002 (High-Tech Bubble deflated) and in September/October 2008 (Lehman Brothers bankruptcy). 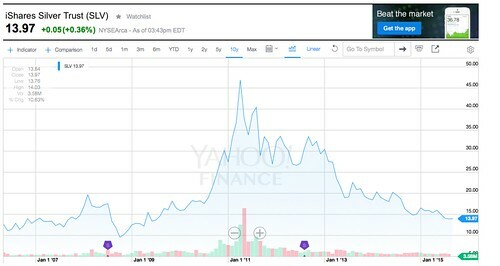 These extreme sellouts are indications that the worst of the correction may be over. 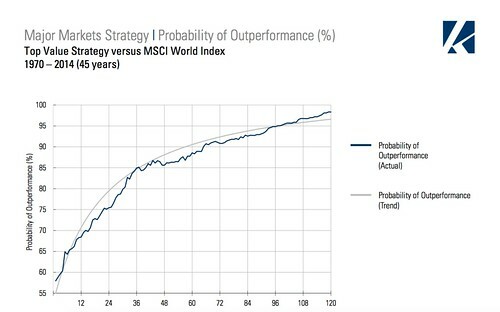 In the past, in each case the MSCI World Index was higher one year after: The average one-year total return was 14.2 %. The graph below shows the performance of the State Street Global Advantage Major Market Fund has outperformed the Morgan Stanley MSCI Index since 1963. The nature of good value investments is that they can have their best performance after a strong upwards movement of a poor value market. The US market has been a poor value market for years, but due to low interest rates and an overly strong US dollar, American shares have surged far ahead of other equity markets. Even if US interest rates begin to recover and the US market rises more, history suggests that good value markets will rise even faster. Market timing is not our goal, but there is a logic to the thoughts above. Buying into good value is always the best way to invest, but right now perhaps this is a better time than normal.